I am adding video montages to some of my entries so that you can actually see the things I experience when I travel. The first video is part of my Namaste India series. Please click here to watch it. I would appreciate your comments and feedback! What else could I be talking about other than the Taj Mahal? This beautiful monument needs no introduction. It is one of the most recognized buildings in the world, and is regarded as the symbol of love, as King Shah Jehan built it in memory of his favorite wife, Mumtaj Mahal. 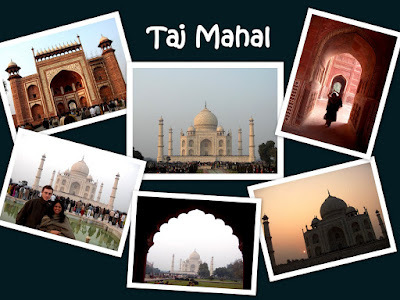 Ever since, the Taj Mahal has become a very popular destination, especially amongst honeymooners. Although I had already been to the Taj Mahal once, it did not fail to awe me a second time. In order to keep pollution under control, motor vehicles are not permitted near the complex, and therefore, visitors can either walk or take a cycle-rickshaw to the site. I took a cycle-rickshaw and was dropped off at the ticket booth. My goodness, if you had only seen how long the queues were! The site had been closed that morning as French President, Nicholas Sarkozy, had come for a visit and so, naturally, all the tourists ended up coming in the afternoon. Men and women stood in separate lines to enter the site, some trying to just "casually" cut in. You can just imagine how chaotic it was, and I just couldn't wait to get out of the madness. Prior to entering, there was a security check, which was quite pointless as although it beeped sometimes, bags were not checked. After about 20-30 minutes or so, I finally managed to get in. Those visiting the Taj Mahal, please note that you have to pay to be able to use your camera and video camera. The Taj Mahal was so breathtaking to look at. It has such a dominating presence, that I just forgot everything else and stood mesmerized by it. What I found especially amazing about this monument was the planning that went into its structure. Every part of the building was so meticulously planned, and just thinking that all this was done centuries ago, without the technology we have today, made me admire it even more! All the intricate designs in the building were not drawn, but carved in marble stone. The minarets surrounding the main tomb are deliberately slanted slightly outwards so that in case there were an earthquake, they would fall outwards and not directly on the Taj Mahal. Everything is so symmetrically laid out, it is just so impressive. I couldn't get over how they were able to think through all this at that time and execute the plan so perfectly with limited technological resources! My heart did go out to all those poor workers who worked so hard to fulfil Shah Jehan's wish. Although it was very crowded, I tried to walk around the complex to take in the beauty of the Taj Mahal. The sun was gradually setting as well, and created a beautiful backdrop for my photos. I spent a couple of hours there, after which I decided to return to my hotel. I know I will never tire of visiting this beautiful place again, and am hoping it will be sometime soon! Chandigarh turned out to be very different from what I had expected it to be. I knew that the city had strong historical importance, especially during the India-Pakistan partition. As the capital of Punjab and Haryana, I thought it would be similar to other major cities in India, like Chennai and Delhi - noisy, very crowded, curious looks from the locals...somewhat chaotic. Much to my surprise, I found the city to be rather quiet with people minding their own business. I could also see that generally, the people from this area were better off than those in most parts of India. As I entered Chandigarh from Shimla, the first thing I noticed about the city was its roundabouts. Chandigarh is full of roundabouts, and has roads that are neatly laid, making traffic easier to control. In fact, I encountered so many roundabouts that I had to pinch myself to make sure I wasn't in France, which is famous for its roundabouts. Well, there is a reason why Chandigarh is designed like a French city. It's because the city was planned by Le Corbusier, a famous Swiss-French architect. The first place I visited was Pinjore Gardens, which is situated on the Chandigarh-Shimla route, and is about 20km from Chandigarh. This garden is apparently popular amongst young adults, and lots of people come here to picnic. Unfortunately, the park didn't appeal to me that much, and so I proceeded on to my next stop - Nek Chand's Rock Garden. While I am not crazy about artificial parks, I found Nek Chand's Rock Garden to be quite fascinating. This park is mostly made up of recycled materials and offers visitors the chance to reflect on their own recycling habits. I was pretty amazed to see statues that were made out of broken toilet bowls and tiles, broken bangles, and lots of other things one would just throw away without a second thought. Seeing these different statues definitely made my visit very interesting and I could see that it was very popular among kids. What a great way to entertain them while teaching them the importance of recycling! After visiting this garden, I stopped by Lake Sukhna for a short stroll. Lake Sukhna is an artifical reservoir that was also created by Le Corbusier, and is a popular area for locals to go jogging, enjoy paddle boat rides and just spend their afternoons chatting away. Again, visiting this place gave me an idea of how people from Chandigarh spend their free time, and it was quite fun to watch them. My final stop in Chandigarh was the International Doll Museum, which features dolls in different costumes from all over the world. The section I enjoyed most was the Indian brides one, where dolls were dressed in their traditional bridal clothes from each state of India. Seeing these dolls representing different states in India only reiterates how rich Indian culture, customs and traditions are. I can't think of any other country that is this diverse! While admiring these beautiful dolls, I was naturally drawn towards the Iyer doll dressed in its 9 yards saree. It reminded me of myself, hehe! On the whole, Chandigarh surprised me with its modernity. Although it was not a highlight for me, I still had a good time, and hope that I will be able to spend more time there in the future. My day in Chandigarh came to an end and I bid farewell to lovely Punjab as I boarded my Shatabdi Express to go back to Delhi for the night, before proceeding to Agra. Be on the lookout for my next entry on this truly wonderful city! 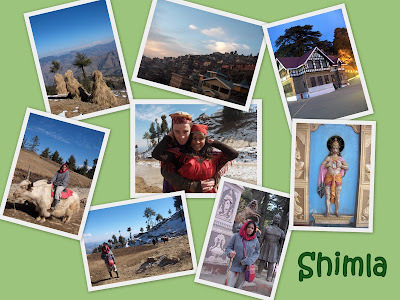 My next stop after Amritsar was the Himalayan city of Shimla. This, again, was a major highlight in my trip, as it was my first time in the Himalayas. It was a 9 hour drive from Amritsar to Shimla, and I admired the driver skilfully navigate the steep and winding roads as we drove up the mountains. We crossed the Punjabi border and entered the state of Himachal Pradesh and along the way, the driver put some Bhangra music, which was quite entertaining at first, but became very repetitive after some time. We reached Shimla at around 10pm, and boy, it was freezing! I wasn't dressed for the winter as I was in my Salwar Khameez, so I struggled quite a bit to manage the freezing temperature. The hotel I stayed at was the Comberemere Hotel, which is very well located-right in the midst of the night bazaar, known as Mall Street. While the hotel is nicely furnished in a wooden cabin style, I couldn't really enjoy my stay there as the heater in the room did not work on both nights. Despite bringing my concerns to the attention of the hotel staff, nothing was done to rectify the problem. Hence, I slept with layers and layers of clothing, gloves and socks and shivered as I tried to fall asleep. I woke up to a bright sunny morning and had some quick breakfast at the hotel. I was to visit the Himalayan villages of Kufri and Chail during the day and return to Shimla to discover the exciting nightlife. We drove up the mountains to these villages and had phenomenal views of Shimla. Shimla is so different from other Indian cities in that it is mainly made up of British colonial style buildings, and has quite an European feel to it. The locals have more Eastern Asian features, and kids are so adorable with light brown skin and bright pink cheeks. Once we got to Kufri, I mounted on a horse and was led by a young boy up the mountain trail. I rented some boots thinking they would protect me from the cold, but how wrong I was! My feet became so numb! And despite putting on layers and layers of clothes, I was still freezing! After the 1/2 hour ride up, I got off and explored the mountainous region. This area was sparsely populated with young kids running around and women hard at work. I noticed that there were many Indian tourists too, mostly on their honeymoon. I soon spotted some yaks at a distance. They were so cute in a very strange way, and were obediently posing for photographs with the tourists. I, too, wanted a bit of that fun and climbed on one of them for a photo, hehe:). David and I then got the chance to dress up in traditional costumes from the region, and we were instructed to pose in various ways for the camera. I love sampling traditional clothes from different cultures, and so, enjoyed this bit quite a lot! After this, I proceeded to the Jakhu temple, tucked away further into the mountains. This is a Hanuman temple, where apparently, Hanuman rested while on his way to the Himalayan mountains. As excited as I was to see a whole temple dedicated to Hanuman Himself, I was getting slightly nervous. As we approached, I noticed troupes of monkeys gathered around all over the temple. I felt them scrutinize every move I made, and I started to feel terrified. At the entrance, a man was renting out sticks for 5 rupees to help chase the monkeys away and I rented one and mustered every bit of courage I had to walk up the steps leading to the temple. With every step I took, I banged the stick loudly on the ground, to threaten the mischievous monkeys. Despite putting up a brave front, I was really scared that they would just attack me. I didn't even get to sincerely devote some time to Hanuman as I was too busy being worried about these monkeys. I think I spent a maximum of 10 minutes there (which seemed much longer when I was there!) and quickly came down. As you can see from the photo, fear is written all over my face:). During the few quick stops along the way, we got to see the world's highest cricket ground (which is now fully occupied by monkeys! ), and we returned to Shimla around sunset. This is the most beautiful time of the day, as you can see the sun gradually setting behind the mountains. The sky was a wonderful blend of light blue, dark blue and orange. A picture perfect scene. Shimla is so beautiful at night, because it is full of people, the city is beautifully lit up, and stall vendors are busy trying to make business in the bazaar. A bustling city - just what I love! It was a lovely walk through the bazaar, where I bought some fruits and enjoyed looking at the various handicrafts being sold. After a busy day in the Himalayan region, I retired to my freezing room and fell asleep. 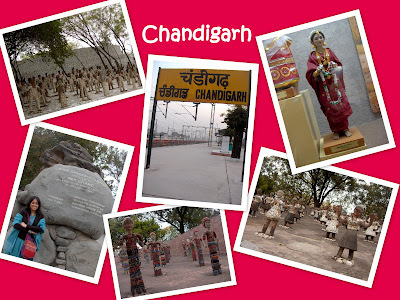 The next day, I was to visit Chandigarh, and you will find out more about that in my next entry! 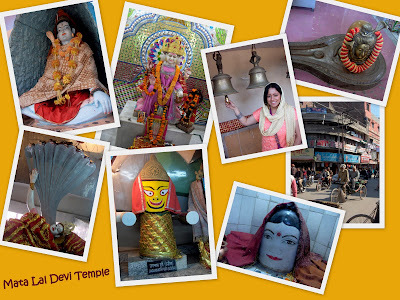 I hadn't heard of the Mata Lal Devi Temple before. I only came to know of it in when I was in Amritsar, and people told me that it was a must see. So, right after visiting the Golden Temple in the morning, I made my way through the bustling streets of Amritsar to visit this beautiful temple. The temple does not have the typical gopuram structure, and looks very simple from the outside. It is the interiors that capture your attention. You can find all kinds of deities here, of all sizes, and what is most striking about them is their facial features. I think most deities in North Indian Hindu temples tend to have large eyes, and are very human like, unlike those in South India, where very often, the deities are made out of black stone or metal. The most interesting and fun part about this temple is the way you actually visit it. It somewhat seemed as though I was walking through a maze. A maze of mirrored walls, filled with colorful flowers and bells. At one point, you even have to crouch and crawl through a narrow tunnel filled with water. As you crawl, you get to see many deities. I saw so many types of Shiva Lingams, a statue of Brahma (which is quite rare), and several Godesses like Saraswathi and Kali. I did not really come across any priest, so I just ended up praying on my own. While visiting this temple was a spiritual experience for me, I also had so much fun going from one point to another. Wherever you turn, there is some God or Goddess watching you. Best of all, there weren't many people at all, so I really found my time there to be very peaceful. Now, you know you shouldn't skip this temple if you go to Amritsar. Along with the Attari-Wagah border and the Golden Temple, it is such a beautiful experience, that will stay on in my mind forever. Only one word can describe my experience at the Golden Temple: Overwhelming. The Golden Temple, also known as Harmandir Sahib, is the holiest place of worship for Sikhs, and is the main attraction in Amritsar. As I spent a night in Amritsar, I had the chance to visit this amazing site in the evening and in the early morning. Visiting the temple at both times of the day allows you to see it beautifully lit up in the evening, and eat in the kitchen and have a more detailed visit of all the facilities in the morning. So, make sure you allocate enough time to fully enjoy this place. All men and women must cover their heads, regardless of their religion, and wash their hands and feet before entering the main entrance, Darshani Deori, which is a Victorian style white building. Those who do not have shawls can always purchase head bandanas at the entrance for 10 Rupees. You can return these at the end of your visit, but if you choose to keep them, you can do that too. My heart skipped a beat as I entered the holy site. After walking down the stairs in Darshani Deori, I could see the Golden Temple glowing in the middle of the giant pool of water, Amrit Sarovar, which gave clear reflections of the temple. The place was so serene, especially with the full moon in the background. Some people were praying and gently touching the holy water. The chanting taking place in the temple could be clearly heard and I listened to the soothing harmonium music accompanying it. There was no hustle and bustle anywhere. Just people offering their prayers quietly, walking around Amrit Sarovar, and admiring the Golden Temple's beauty. Just being there made me feel so special. I also quietly offered prayers and touched the holy water for blessings. I took my time to walk around, until I reached the entrance of Harmandir Sahib. The place is so well organized; red carpets are laid, and entrance and exits are neatly separated. I was skeptical as to whether I could enter the temple itself, as a non-Sikh, but the guards humbly advised that anyone could go in. The chanting and harmonium music got louder. A strange feeling started to take over me. I don't know how else to describe it other than to say that it is similar to when one sees Lord Venkatajalapathi in Tirupathi. This is a very powerful feeling. Once inside the temple, I saw a number of devotees who had gathered around the holy Sikh book, the Guru Granth Sahib, and were being led by a priest in the chanting. I just observed and quietly walked around the shrine and said my own prayers. I was probably there for a maximum of 8 minutes, but these minutes left such a lasting impression on me. It was one of the best experiences in my life. I left the Golden Temple and returned the following morning. This time, I got to see the guesthouses (people can stay for free) from the outside, and also visited the large kitchen, dining and washing areas. The utensils for cooking are just humungous, as you can see in the photo! Sikh men and women were working hard, making roti, dhaal, spinach curry and sweets for the thousands of visitors. All of them were smiling and happily chatting away while cooking. It was such a great sight. I got so excited when they invited me to eat in the dining area. I was escorted into the dining area where rows and rows of eversilver plates were set out on the floor. I took my spot and was immediately served some roti, dhaal, spinach curry and some water. The servings were quite large, but you shouldn't waste food, so I had to force myself to eat everything, as I had had a full breakfast at my hotel just an hour before. The spinach curry was really spicy, so I tried to gobble it down as fast as I could. 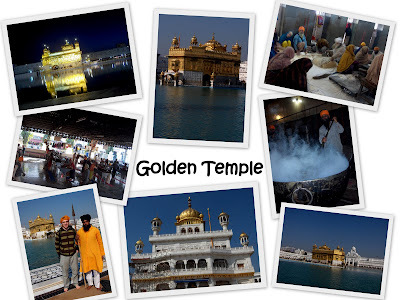 Despite all of this, I felt so blessed to eat at the Golden Temple, and treasure this memory with my heart. I then got to see the locals busy cleaning the plates and utensils one after another. All this, again, with smiling faces. I learnt that all Sikhs are expected to volunteer for a week at the temple. Young kids and older folks were also singing religious hymns outside the temple, and I found it so nice to see so much involvement by all generations. As I left the Golden Temple to proceed to Mata Lal Devi temple, I reflected on my experience there. Seeing the temple itself, was no doubt, a great experience in itself. What touched me most, however, was the warmth and love I got from the Sikh people. There are no limitations as to who can enter, eat or sleep there. The Sikh people welcome everyone with open hearts and minds. No entrance fee is required, no one bothers you to give them money. In fact, if you do give money, they refuse to accept it. Those who do wish to donate, though, can do so by putting money in the donation boxes in the site. I was amazed at the hospitality and kind heartedness of the people, who treated me as though I was one of their own. They were eager to know who I was, and once they heard my name, they kept trying to convince me that I must be a Punjabi girl! It was so amusing, but I loved every minute with them. Needless to say, I felt so much at home here, and am itching to visit the Golden Temple again. I was bursting with excitement as we slowly approached Amritsar on our Shatabdi Express. I had heard so much about this beautiful city, that I just could not wait to get off the train to experience it for myself. The train journey itself was very comfortable and pleasant without the usual crowds. We left Delhi on time, early in the morning, and 7 hours later, we reached Amritsar. The food and service on board the Shatabdi Express were top notch. 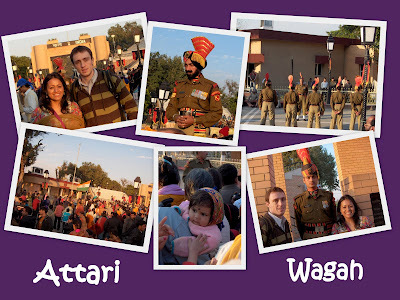 After a quick lunch at our hotel, we left at around 3.30pm to head towards the Attari-Wagah border. The drive to Attari was very scenic, and we got to see the bright yellow mustard fields that we see so often in Bollywood movies. An hour or so later, we arrived in Attari and quickly proceeded to the VIP sector of the stands. For those planning a trip to Amritsar, make sure you get the VIP tickets, otherwise you will be sandwiched in the crowds and won't be able to really see or enjoy much. A sense of pride took over me as I saw the Indian soldiers neatly dressed in their khaki uniforms and red turbans. They were getting prepared for their routine "flag lowering ceremony". Across the border, I could watch the Pakistani soldiers in their dark green uniforms and turbans also preparing themselves. Much of the crowd on the Indian side consisted of Indians from different parts of the country and many European tourists. On the Pakistani side, however, there were far fewer people, but they were equally enthusiastic. The parade started and the crowds got mad on both sides, cheering for their own countries. I, myself, got sucked into the atmosphere (you just cannot help it!) and started shouting, "Hindustan Zindabad!". The foreigners just stared at me as though I had gone crazy, and they did not seem to have any clue as to what was going on. Many found the parade very amusing and giggled away, but I couldn't help but think about how hard these soldiers fight to keep our country safe. After 30 minutes or so, the parade finished and both countries closed their borders. We were then able to descend from our stands and talk to the soldiers and take photographs with them. I told a couple of them that my family and I were grateful to them for all their efforts and that we pray for their wellbeing. This was met with some very humble responses, which were indeed very heartwarming. We then took off as we wanted to catch a glimpse of the Golden Temple glistening in the deep blue sky. I'll share that very special experience in my next post! In the meantime, enjoy my video montage of the parade! Vibrant colors! Bollywood! Spicy food! History! Temples! Crowds! Cows! These are few words that describe my beautiful country, India. My first stop was Delhi, where I got to see many well known attractions such as the Red Fort, Raj Ghat, Qutb Minar, Jama Masjid, Humayan's Tomb, and the Birla Temple. My personal favorites in this city are the Qutb Minar and Humayan's Tomb. Maybe because I went to these places early in the morning, when everything was so peaceful with no tourists, but I loved the intricate designs on the architecture of the Qutb Minar, and enjoyed walking around the ruins. Also, Humayan's Tomb, an UNESCO World Heritage Site, looked very majestic from the outside, and the whole place was just so serene. I also made a quick stop at India's largest mosque, Jama Masjid, which is indeed very vast and has a beautiful structure. Take note of visiting times, as non-devotees are only allowed entry on specific days and times. Finally, how could I leave Delhi without going to Connaught Place and Janpath?! These are large indoor and outdoor bazaars, respectively, that sell varieties of clothes, jewellery, art and books, and you must be prepared to spend a lot of time there, as bargaining for the price you want can be very time consuming! I spent 4 hours there after much haggling, and ended up getting some clothes for a wedding and some Amar Chitra Katha comic books to read during my train journey to Amritsar. Next time I go to Delhi, I will definitely make a stop at this shoppers' paradise :)! 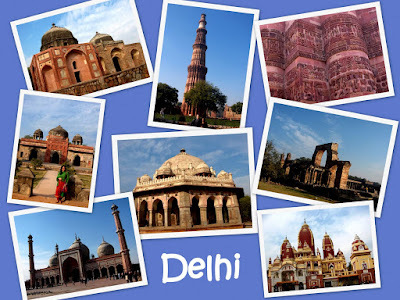 Enjoy this short video on my favorite sites in Delhi, created by Trevenki Productions. Special thanks goes to Isabelle T. who designed the Ganesha image. Wait, Did I Just See Mario Bros??? What better way can there be to wrap up the weekend in Portugal than by cruising around in the über cool GoCar!?!?!? 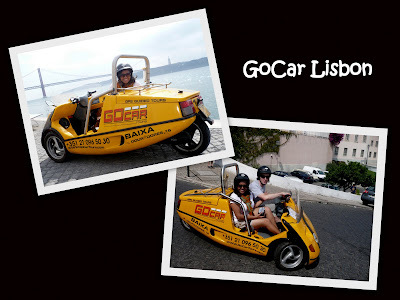 Yes, on my last day in Lisbon, David and I went to the GoCar Tours office in the Baixa/Chiado district to rent a GoCar for 4 hours. We were really lucky that they had a vehicle for us, as usually, you would have to book in advance, as the number of cars is limited. We paid 60 Euros for a 4 hour tour, and I must say that although it is a bit pricey, it was a fantastic and unforgettable experience! It's one of those things where you've got to be there to know what I am talking about. We were given helmets and sat in the GoCar, strapped on our seatbelts and were ready to go. The staff handed us a GPS and a map, and explained the roads we were authorized to take and provided recommendations on organizing our time between districts. Off we went! Never have I felt so close to the road surface before! We started the engine and headed off towards Belém first. Wherever we went, heads turned and eyes stared. People , locals and visitors alike, were in awe and shouted, "Hey, where d'ya get that! That's so cool!" We were on the main roads, obeying the instructions from the GPS which even demonstrated some sense of humor from time to time. The noise from the engine was really loud and rather unpleasant, and I am sure we must have annoyed those trying to sleep in on a Sunday, hehe. But this really was a thrilling experience, making me feel as though we were in a Mario Bros video game...until the GPS just started talking nonsense and we took a wrong turn. The turn couldn't have been worse as we found that we were entering a fairly busy highway! Cars started honking at us, people shouting across their windows to tell us we were not allowed to enter. We couldn't reverse, however, and just started to panic. To top it off, neither of our phones was fully charged and I started to get mad at myself for not being better prepared. We stopped the car and started making phonecalls to the GoCar office. The staff didn't pick up the phone initially, and at this point, we started to worry. Finally, we managed to get through after 10 minutes of waiting at the side of the highly. The staff patiently advised us to continue along the highway until we see a right exit leading to a parking lot. They also told us that this had happened twice before, that too, to some people from Switzerland, so that made us crack up as we were now third on their list. All we could do at this point was to pray that the parking lot was open, and we were so relieved to see that it indeed was! Phew! We then managed to make our way back into downtown Lisbon. 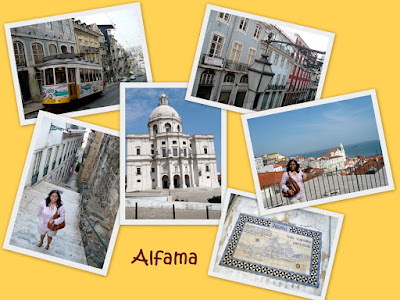 After that, we went to Alfama, which was the best part because of its steep and winding roads. Oh, the sensation of just going down the bumpy roads and enjoying the views of the city! It was really cool. 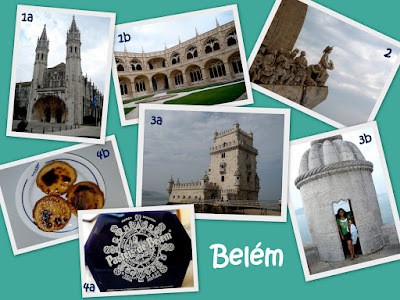 On my 3rd day, I went to Belem, which is about 6km away from Lisbon's city centre. The easiest way to get there is by bus and you have to get off just before the Mosteiro dos Jeronimos. The Mosteiro dos Jeronimos, a monastery, is a magnificent structure that has been constructed in the Manueline style (Portuguese gothic style). This monastery had great significance during the Age of Discovery and was built to mark Vasco de Gama's successful voyage to India. 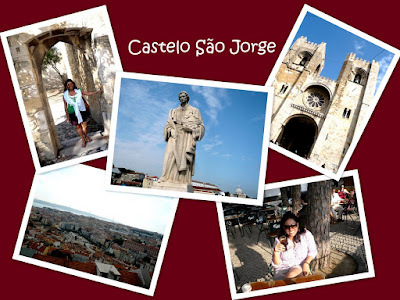 After visiting the monastery, I made my way to Torre de Belém, one of the highlights of my trip. This fortified tower, which is situated at the mouth of the Tagus River, was very important as it represented various maritime discoveries, served as a defense point and was also a gateway to Lisbon. Finally, coming all the way to Belém, I could not leave without trying the Pastéis de Nata from the best and most famous patisserie, Pastéis de Belém. Needless to say, there were throngs of people desparate to get their sweet custard treats. I knew better as I just entered the cafe and continued going further and further and found out that the place is actually a massive restaurant that has loads of seating space. So, I got my table and ordered these delicious tarts. YUMMY! Really great stuff, but you can't eat too much of it as it is just plain sinful! Don't expect great service though, as the place is always packed and waiters are always on the go! When I first told people that I was going to Portugal, they all said that I should visit Sintra, and boy, am I glad I did! Sintra is a historic town where Portuguese royalty resided for many years and is located just 30 minutes by train from Lisbon. Once I arrived at the train station, it only took me 10 minutes to walk all the way up to the town centre. 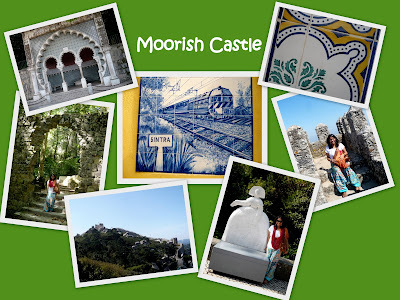 Once there, I purchased round trip tickets to go by minibus to the Moorish Castle, Pena Palace and the Quinta da Regaleira estate. The wall layout of the Moorish Castle somewhat looks like the Great Wall of China, although much smaller of course. 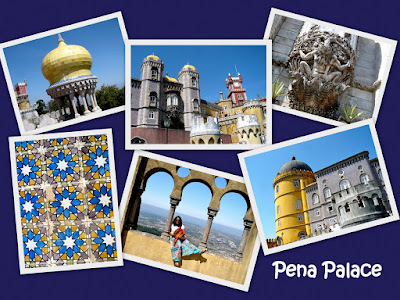 I walked up to the towers to enjoy breathtaking views of Sintra and could even spot the colorful Pena Palace from there. 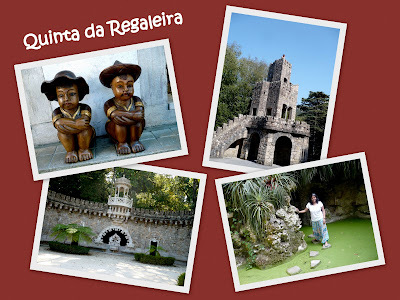 After seeing these two magnificent sites, I had a picnic lunch and went on to visit the Quinta da Regaleira estate, which consists of a palace, a chapel and a park. This park is so different from any I have seen before as it has caves, tunnels, wells, lakes and fountains. I walked on a detached stone pavement set in a small lake to enter a long, winding cave, and eventually climbed up a well to enter a whole different area of the park! Adventurous, eh?! It really was loads of fun, trying not to bump into people in the dark and fidgeting around to find the way out! This is a great place to play Hide and Seek:)! Sintra is a must see if you go to Portugal and make sure you allocate a whole day to visit this lovely Unesco World Heritage site! I also got to visit Castelo São Jorge, and this too, was a very pleasant experience. The castle is surrounded by lush green parks and flowers and is well maintained. What made my time at the castle even more special was the very soothing sound of the acoustic guitar played by a local musician, Pedro Godinho. It made me feel like I was in the movie, Vicky Cristina Barcelona, hehe. This place is also a great place to just chill out, enjoy some drinks and some Portuguese pastry. One of the most striking things about Lisbon is its architecture. 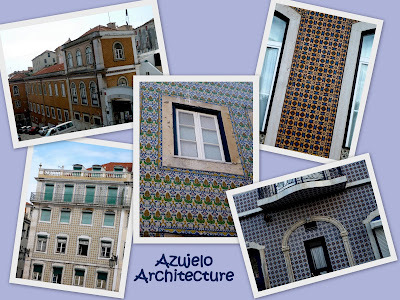 Buildings, especially in the Alfama district, are very close to one another and many of them are designed with Azujelo tiles. 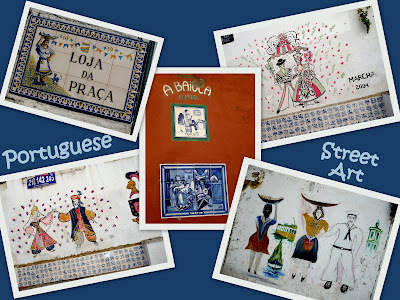 These tiles are typically found in houses, restaurants, cafés, train stations, churches and castles and have a huge significance in Portuguese culture. I absolutely loved seeing how the patterns varied on each building and feel that this mix of colors and designs makes Portuguese architecture very unique indeed! 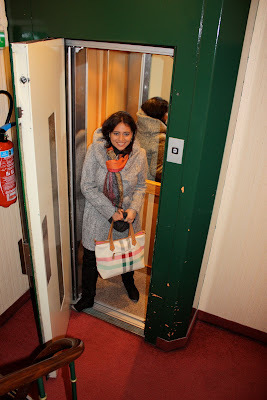 You must think that I am really obsessed with lifts, but this one is definitely worth blogging about. I have seen trams, buses, trains, bikes and taxis transport people from one district to another, but never have I seen or heard of a lift that does exactly just that! 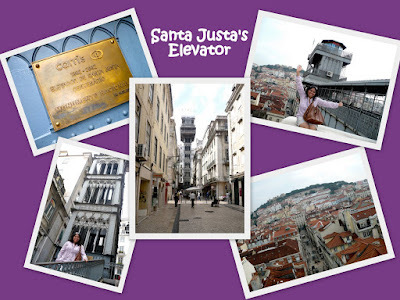 The Santa Justa’s Elevator connects the Upper and Lower parts of the city in just 3 minutes. Just imagine the time saved by using this lift, instead of walking up and down steep roads! Not only that, once on top, you have stunning views of Lisbon. Did you notice any similarities with the Eiffel Tower? That’s because this masterpiece was designed by Raul Mesnier de Ponsard, an apprentice of Gustav Eiffel. Besides this lift, the other thing I found interesting was the funicular service, literally a one-stop tram that brings people back and forth on just one street. It is like going down a straight slope on a sledge, and doing it over and over again! Will be back with more to share! First Time in Lisbon? Check This Out! Getting around the city with public transport is fairly straightforward and inexpensive. I bought a 3 Day 7 Colinas Pass, costing 12 Euros, for unlimited use on buses, trams, funiculars and elevators. 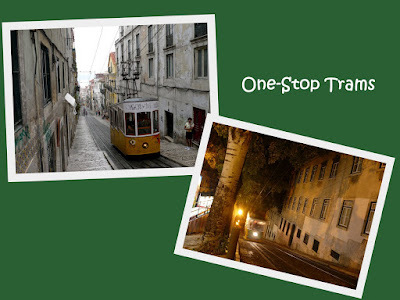 You can get more information from the Turismo de Lisboa website. By doing the above, I did not feel rushed at all and could truly enjoy every moment in Lisbon. Detailed information about each of these segments coming up next! Portugal is a country that is steeped in history and has a rich culture, therefore making it a destination I’ve wanted to visit for quite some time. I finally got the chance to get a glimpse of this beautiful country last September, when I went there for a long weekend, and it is definitely a place that I would like to visit in the future, in more detail. I flew to Lisbon with TAP Portugal, the national airline, and had quite a pleasant flight experience. TAP Portugal seems to be quite a reliable company. Just make sure you buy your tickets well in advance to benefit from cheaper rates. The hotel I stayed at is the Hotel Sete Colinas, located at Avenida Almirante Reis, 67. It costs about 20 Euros to get to this hotel by taxi from the airport. This is a decent hotel that provides the bare essentials that every traveler expects: very clean rooms, good service, personable staff and the best of all, its superb location. I’ll be back with interesting information on Lisbon sightseeing in my next post! When I first moved to Geneva 2 years ago, the first thing that caught my attention was the lift in my apartment building. Having previously lived in Singapore and the States, I have been used to big and spacious lifts that can fit at least 5 people. So, seeing this tiny lift that could only fit a maximum of two people, and is so old fashioned, rusty and jerky came as quite a shock to me, and I felt relieved that I didn't really need to use it as I live on the first floor. Well, it's been two years now, and I must say that I have gotten used to this lift, and even admit that I have become quite fond of it. I always thought that my lift was the smallest one to ever exist, and was proud of this unique characteristic. Well, how wrong I was when I saw the lift at the hotel I stayed at in Paris!!! Now, this beats all other lifts in the "smallest lift in the world" competition. I was surprised to find that two adults could actually fit in, rather uncomfortably though! Again, this adds to another "unique" experience in the City of Lights! Before going to Paris this time, I did some research on restaurants, cafes and bars to see if there were any places that really appealed to me. I came across reviews about a café/restaurant called Angelina’s Hot Chocolate and was amazed to see reviews unanimously commending its hot chocolate. Just reading those reviews made my mouth water and I made it a point to have a cup of hot chocolate there. Imagine my huge disappointment when I saw the loooooooooong queue at the entrance of the café! I was crushed that I could not get to try the “best hot chocolate in the city”. 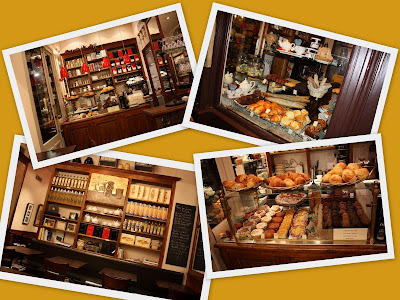 The following morning, I decided to have breakfast at a café called Pain & Chocolat, situated on 16, avenue La Motte Piquet in the 7ème Arrondisement. Now, I can safely say that going to this café is one of the best experiences in my life!!! There is a lovely couple in their mid-60’s running the place, and the café is so cosy and has a very homely décor. I ordered a Continental Breakfast which included freshly baked croissant and bread, 2 types of jam, butter, freshly squeezed orange juice and hot chocolate. The croissant is the fluffiest one I have ever had, bread never tasted this good and finally, the hot chocolate was simply out of this world!!! I loved it. My only regret is that I did not order another one! 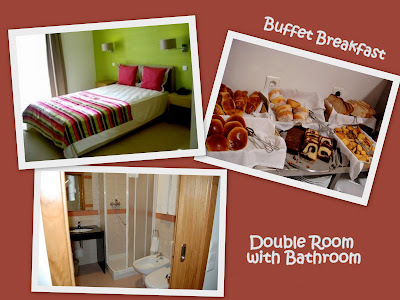 Besides different kinds of breakfast, they also serve brunch, lunch, pastry and viennoiseries! So folks, if you get a chance to visit Paris, make sure you go to Pain & Chocolat, as it definitely well worth it! I have been to Paris before. In fact, I have been there 3 or 4 times and have done most of the typical touristy stuff. But every time I leave the city, I just want to keep going back. Paris just has that effect on you. It may be the feeling of being enveloped by the grandeur of this vast and dynamic city or the magical charm this romantic city possesses that allures both the locals and visitors. Whatever it is, I consider Paris as one of the most unique and beautiful cities in the world, and I feel lucky to have had the chance to visit it again, especially during the end-of-year festive period. 1. Ascend to the summit of the Eiffel Tower to enjoy breathtaking views of this marvelous city*. 2. Explore the Montmarte area, which is famous for the Sacre Coeur basilica and its artists’ square. 3. Visit the Chateau of Versailles and its lush gardens**. 4. Even if you are not into museums like me, I do think the Louvre is definitely a must see***. 5. Stroll along the famous Champs Elysées, where you can see the Arc de Triomphe. 6. See the magnificent complex of buildings in Les Invalides. 7. 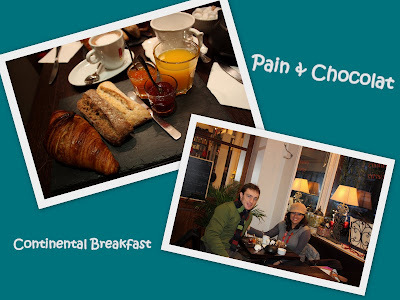 Enjoy simple but exquisite breakfast at Pain et Chocolat! Simply out of this world! 8. See the Opera and les Galleries Lafayettes by night. 9. Take a peek at Place de Clichy which is a sleazy area of Paris. If you have time, you can enjoy a cabaret performance at the Moulin Rouge****. 10. Visit the Notre Dame de Paris and enjoy drinks or dinner at St Germain du Près! 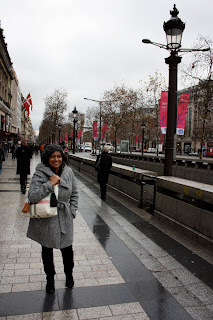 I will put up a few individual posts of certain experiences in Paris that I truly enjoyed. Be on the lookout for those in the coming days! *You can book tickets in advance to avoid the long queues. Tickets can be bought online at www.tour-eiffel.fr . **Again, queues to enter the château are very long and time consuming. The online ticket shop is currently closed, but you could always purchase tickets from the Office du Tourisme which can be easily found on the way to the chateau. They do not sell tickets on public holidays though, and in this case, you can purchase tickets from travel agencies such as Guida Tours, http://www.guidatours.com/ . There is an additional charge of 2 Euros, but this is insignificant when you think about how much time you can save from avoiding the queues. ***I think you can buy tickets online in advance but I am not sure. You can get more information about tickets here: http://www.louvre.fr/llv/pratique/venir.jsp?acces=1 . I just found out by chance that on the first Sunday of every month, all visitors can enjoy free access to the museum. You can use the lesser known Porte de Lions entrance for that as there are much lesser people there. ****Make sure you book your tickets well in advance from the website! First and foremost, I wish all of you out there a very happy and prosperous 2010!!! Compelled by my huge passion for travel, I have created this travel blog as I thought that it would be a great idea to keep an account of my travels and share these experiences with my family, friends and anyone else who like me, loves travelling. 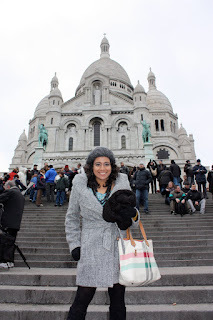 I welcomed 201O in Paris and so, my first few blog posts will be about this beautiful, romantic and magical city! 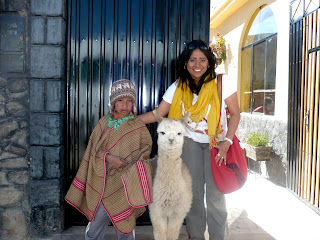 Hope you enjoy reading my travel adventures as much as I enjoy writing about them!